By video news producer Charlotte Krol / Caters TV. Video and photos by David Badenhorst / Vergenoegd Wine Estate. How do you train the ducks to run back and forth? We have flock herdsmen that guide our ducks to and from the vineyards on a daily basis! So, a little guidance and a little routine ensures that our ducks know exactly where to go! So many ducks in the grapewines must produce huge amounts of droppings. Bird manure is high in nutriment, but especially Nitrogen. My first thought was that it could be damaging to the wines. How has it modified soil analysis and grapewines growth? How do you manage the manure left behind daily? Thank you for showing interest and connecting with Vergenoegd! Duck manure is indeed very high in nitrogen but due to the fact that our ducks are constantly on the move between vineyard blocks, there is never a build-up of droppings on one specific spot, thus the small amount of droppings over a large area serves as a limited but rich source of natural fertilizer – too little to cause any damage to the soil or vines. Please let us know if you would like any further info and feedback! 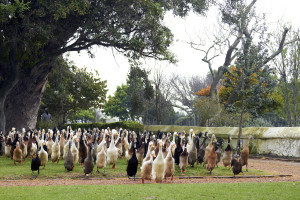 I live in the Eastern Cape and came to see your Ducks last March, it was fantastic! I have got 7 of my own Runners from a different source, as your ducks were in quarantine at the time, but I would love to get a pair or 2 from you as mine seem to be a bit inbred. I am coming to Cape Town this weekend (26&27 May). Are there any ducks to buy at the moment?